What is SAP Material Management? SAP Material Management is sole and integrated software in SAP ERP system to manage material resources and its complete procedure that a business goes through during the procurement, production storing, selling and inventory management related activities occurs in day to day business operations. This software provides the business to maintain the material specific data at central location and then retrieve it for different purposes whenever it requires. It records such information in individual material management master records. SAP Material Management is integrated with different modules of SAP ERP system. These are mainly SAP Financial Accounting and Controlling (FICO), Sales and Distribution Management (SDM), Quality Management (QM), Plant Maintenance (PM), Production Planning (PP) and Warehouse Management (WM) etc. This integration enables the organizations to store database object at single place and eliminate the redundant data storage. As we know that automation of the business processes reshaping rapidly, so there is an increase need for such professionals who are equipped with the skills of using computerized systems of handling business activities in which material management and planning is a prime factor. SAP Material Management Certification from Brainmeasures is the right choice to fulfil the gap that is much needed now-a-days from business personnel, information systems and management accounting experts. This is a unique and compact certification program which will enhance your expertise and efficiency regarding material management and planning, procurement and inventory replenishments efficiently. 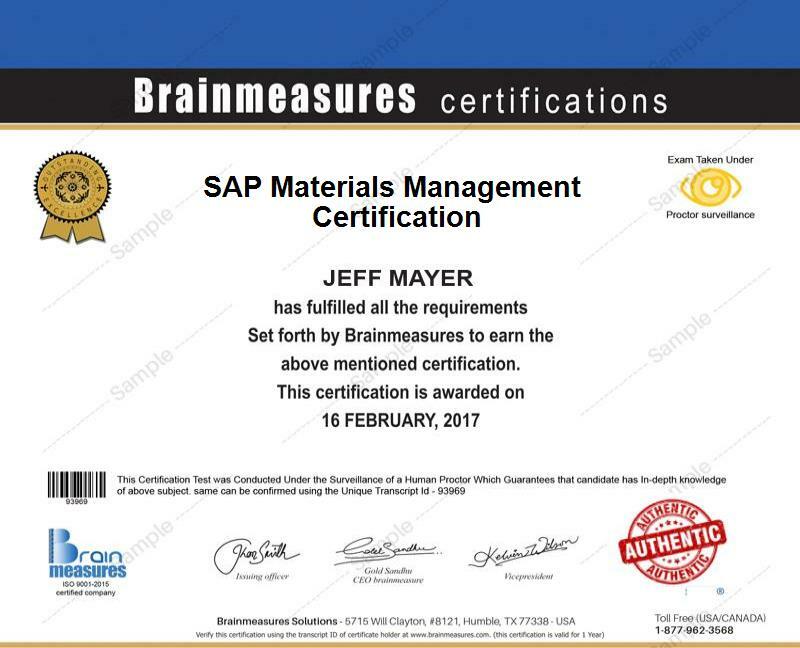 After gripping on SAP Material Management by studying from Brainmeasures, you will be able to know handling material and related activities in automated and computerized environment. So, don’t wait for this lucrative opportunity and get yourself enrolled in the Brainmeasures SAP Material Master. Apart from the course syllabus and study material, an online exam is also the part of this course to assess the knowledge and skills that you will gain during the certification program of SAP Material Management from Brainmeasures. After successfully passing all the required stages of this course, you will be awarded the certificate that will acknowledge your efforts which will lead to an added point not just in your Resume but also in your professional career path. Entitlement of SAP Material Management from Brainmeasures assures a verified and proficient expert of material resource planning, cost controlling and management. This certificate definitely is an added skill to increase your earnings or to get promotion in your career. Average annual salary for those who hold different positions in administrative, accountancy, financial management, procurement and analytical domains in different organizations is $70,000-$95,000 per year which might be varied according to the nature of business industry i.e. IT, Servicing or Manufacturing etc. reputation of the organization in the market, location and expertise of the candidate etc. No doubt SAP Material Management certification is important not only for those who are working as business analysts, office managers, cost controllers, chief accountants, financial analysts, reporting analysts or data mining experts in different businesses but it is equally important for students, material planners and business researchers, business teachers and presenters as well. This certificate is designed for all those people who are working in automated business environment and who are primarily linked with application of cost controlling and material management for business. Beneficiaries of this certification program are office managers, cost controllers, chief accountants, finance executives, data analysts, ERP specialists, business executives, chief operating officers, procurement officers, business owners, students, teachers, researchers and all business professionals etc. This list is just a mere highlighting of beneficiaries that can be extended to all those who are interested to learn about different categories of material, its handling, cost controlling and effectively planning as well as reporting mechanisms in a computerized environment.